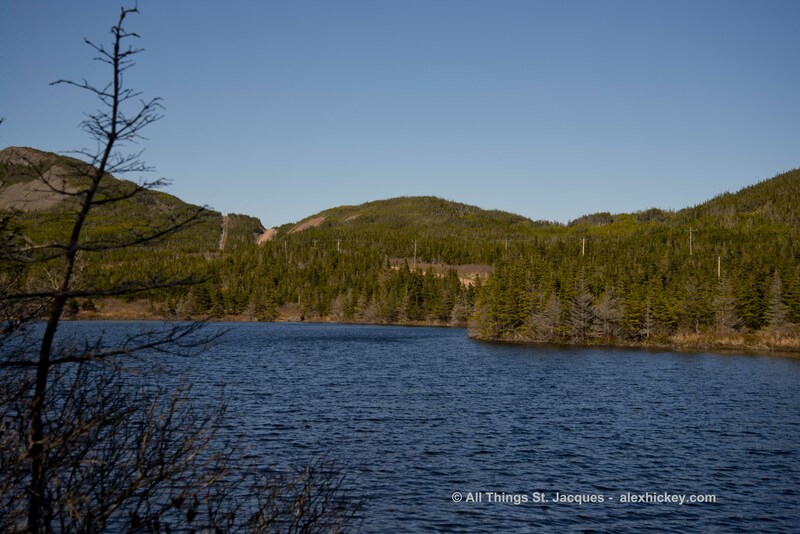 All Things St. Jacques, NL | This site is dedicated to bringing you interesting information about the community of St. Jacques which is located on the north side of Fortune Bay in the province of Newfoundland and Labrador, Canada. It was one of those mornings in February, cold, a bit snowy and barely daylight. My steaming hot coffee was slowly cooling as I busied with a few things around the kitchen. CBC radio’s Morning Show was chattering away in the background, moving from interview to interview then the news. I wasn’t paying much attention. Then, like a prick from a needle, my attention was drawn immediately to the voice. I was certain I’d heard the name, “Dorothy Hickey”! The volume button doesn’t work on that device therefore I had to find the remote to turn it up. By that time the news report had finished and the latest weather forecast was underway. But I did hear the word soccer. That was enough to know the announcer was referring to a woman who has dedicated over forty years to the advancement of soccer in Canada. The next day the Telegram carried a news story about the Newfoundland and Labrador Soccer Association recognizing her for her outstanding contribution to the sport. Here’s what I read about Dorothy or “Dot” as she is known to some. “Hickey has worked for Canada Soccer for more than 40 years, and during that time has overseen the growth and development of the Toyota national championships. She has been instrumental in managing the air travel for teams traveling to the competition and has worked across numerous international matches in Canada. The President’s Award was given for organizing the Annual Meeting on short notice and at the same time working on the Canada Cup in Edmonton which included teams from Guatemala and Ecuador. Well done and a secret well-kept at that! The 2019 award is special. 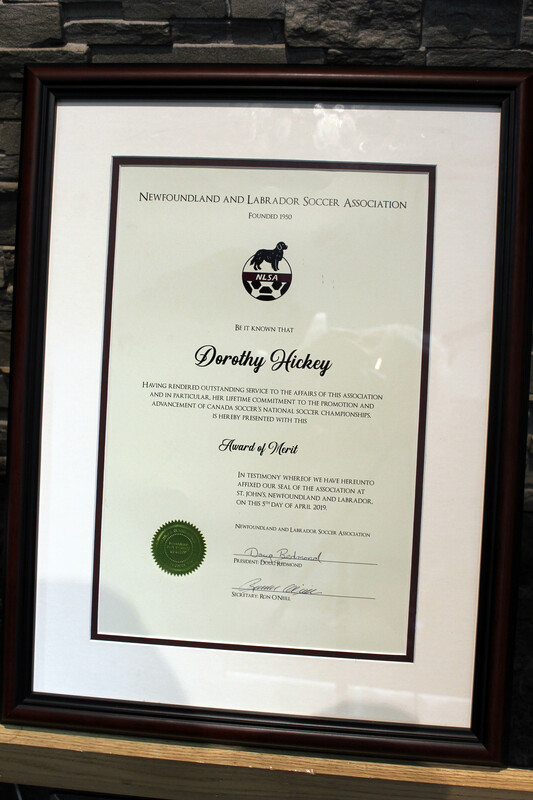 This is the inaugural year for the award and is given as an acknowledgement of the deep respect the Newfoundland and Labrador Soccer Association has for Dorothy’s contribution to soccer nationally and especially for the her efforts to encourage and further the work of the Newfoundland and Labrador organization at the national level. It is always nice when your peers turn to you and say, “Well done! We appreciate your work on our behalf.” It is nice to hear in your immediate place of work but when your work is on the national level it is especially sweet to hear from your home province. Dorothy, daughter of Pat and Patricia (Farrell) Hickey, hails from St. Jacques. That’s not a well-kept secret, for anyone between St. John’s and Vancouver who has ever met her is told in no uncertain terms that she is from St. Jacques, Newfoundland. 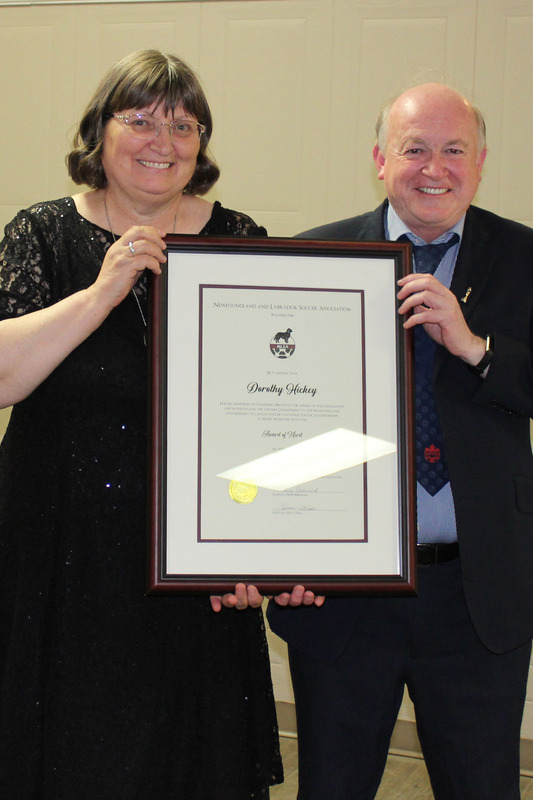 It was evident during the presentation ceremonies at the Shriner’s Club in St. John’s on April 5th that Dorothy commands a presence in soccer circles. Her job with Soccer Canada is Competitions Manager and as such has regular contact with folks across this wide nation. Anyone who knows her is quite aware that she is no pushover when it comes to programming and expecting everyone to carry their share yet over and over it was obvious that there’s a soft spot in her heart for her home province. Thus it was fitting that she be on the receiving end of this prodigious award given during the Hall of Fame Induction and Provincial Awards Night. When Dorothy Hickey left her home town of St. Jacques at the head of Fortune Bay to seek her fame and fortune, little did she know the impact she would have on one of the largest sports governing bodies in Canada. Ottawa and Canada Soccer would never be the same. For more than forty years, her outgoing, friendly and sometime authoritative style captured the attention of all who managed to come into her presence. From the get go, you knew this woman had your back and that she was there for you. In her years with Canada Soccer, Dorothy has handled various roles within the soccer community. Her most noteworthy role has been managing the logistics for competitions, both nationally and internationally. For us at NLSA, she has been a resource extraordinaire. If you had a question or problem pertaining to soccer, if she didn’t have the answer off the top of her head, she directed you to where you could find the answer. Over the years, our office staff and executive personnel who deal with Canada Soccer on a regular basis, have nothing but praise for her knowledge and extraordinary willingness to assist you with your concerns. Dorothy’s outstanding abilities have not gone unrecognized. Canada Soccer, over the years, has certainly realized the contribution she has made to soccer across the country. For her commitment and dedication to the development and promoting of the game, Canada Soccer has honoured her with two of its highest honours. I sat at the table with Dot alongside her brother Don and in the company of Judi Kelloway, a member of the NLSA Hall of Fame and also a recipient of the CSA’s Award of Merit, as well as Angus Barrett, a member of the Canada Soccer Hall of Fame and an NLSA Honorary Life Member, along with their spouses, among others. You respond to it by remembering the person. What you don’t know most of the time is what that person has been doing all those years. Sometimes you are privileged to find out such as with Dorothy. Like most of us who leave our small communities to establish careers, she didn’t set out to become one of the top administrative people in this august organization, Soccer Canada. Nor, I am sure, did she expect to become known throughout the country and internationally for her contributions to soccer. Yet, she has and her peers from coast-to-coast gratefully acknowledge all that she has invested. Despite all of the recognition from elsewhere, the recognition of people from ‘home’ makes the smile last longer. Windowpanes relinquished their transparency as the night wore on. Their new translucent, smoke-grey coating became prime surfaces for finger drawings of initials, names, faces, Santa hats and Christmas trees. The wood and coal pot-bellied stove, burning feverishly since breakfast, had done its job of driving moisture and chill from the room. The creaking hinge of the side entrance door echoed throughout the main hall of the old school that morning when someone’s uncle inched it open. The air inside felt much colder than that blowing down off the evergreen encrusted hillside. After a good douse of kerosene the saturated splits he’d so carefully layered in the burning chamber, burst into flames as soon as the wooden match made contact. A single flame replicated itself over and over in seconds then the entire inferno searched frantically for somewhere else to go. A roar soared across the room through the wire-suspended stove pipe to the brick chimney shared with the kitchen stove. He shut the door all but a quarter of an inch as he selected the three pieces of cleaved wood most likely to catch afire. The roar continued; he adjusted the air vent, the chimney damper, then swiped his hands together in an up and down motion dislodging bits of ash and dust. Across the harbor the message embedded in the rising white smoke was unmistakable, there’ll be a Time tonight. Other stoves were drawing mightily on their drafts, extracting maximum heat to keep the boilers boiling and the ovens baking. Chunks of fresh meat, beef or moose, had already undergone their searing and now gradually cooked to tenderness. Waiting on the sidelines were bowls of carefully cubed carrots and turnip sitting beside chopped onion and a small bowl of uncooked long grain rice. In other kitchens boilers of salt pork simmered on the back burners waiting for a topping of quartered cabbages. Cooked potatoes and carrots cooled on countertops beside their counterparts of tinned sweet peas, luncheon meats or sliced roast beef. Tins of cookies retrieved from their cold storage sat sweating beside lattice pastry covered partridge berry pies and plates piled high with slices of dark and light fruit cake; all destined for the Time. Men’s white shirts, dipped in clothes blue to enhance their brilliance, their collars starched, hung at ready as did carefully chosen women’s dresses, skirts and blouses. Children’s best had been set aside for this night for weeks. A few would sport brand spanking new outfits straight from the fall pages of Eaton’s catalogue. Morning preparations gave way to afternoon anticipations for a Time was an all ages event. Quibbly eaters who couldn’t imagine drinking soup or eating pork and cabbage out of dislike for the menu and those who couldn’t bear the thought of eating someone else’s cooking, ate heartily at home before setting out for the school. By the time the afternoon became duckish a parade of boilers and boxes snaked along the roads and up the hill. The stove in the hall could accommodate but a limited number of boilers thus by arrangement their arrival was staggered throughout the evening. Warmed over soup just didn’t have the same appeal. Tables in the kitchen were set and seemingly within seconds were lined with hungry customers. Children first was usually the rule although a scattered adult male who’d been imbibing throughout the afternoon held no compunction for protocol and found a convenient seat among them. It resulted in a scattered ‘tut-tut’ or shaking of heads; however, by and larger, it was simply smiled at and allowances made, after all it was Christmas. We hadn’t been told the hazards of smoking back then. Consequently, nearly every adult smoked cigarettes or a pipe. Though the ceilings were high the air soon became thickened, casting a soft hazy atmosphere to the hall. Whenever the porch door opened a cloud of smoke and steam erupted into the night. A back door to the kitchen was kept slightly ajar throughout the evening to vent steam, closed only occasionally when one of the women complained of being chilled. Shortly afterwards, within minutes, another would discreetly ease it open again. Such was one of the games carried out in the kitchen. Drinking among the women wasn’t as pervasive as smoking. Yet, during a Time more than one quietly took a nip from a ubiquitous container brought from home, its contents pre-mixed to her personal taste. Men too shared flasks of various spirits, some with official stamps on their necks and others filled so many times that any stamp that might have been there was long washed away. Drinking from the same flask didn’t seem to be a problem for some, while others preferred a tumbler from the kitchen given with the admonishment, “Don’t you break it, or else I’ll have your head!” When confronted upon offering the last few drops in a bottle the usual response to “ I don’t want to drink your last drop”, was, “Don’t worry, b’y, there’s lots where that came from.” And indeed there frequently was. 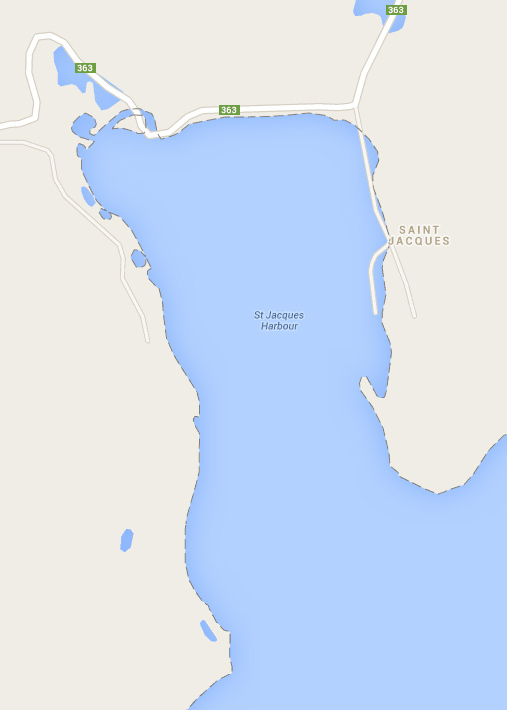 St. Pierre and Miquelon were not that far away. Standing boldly in the corner of the room was an evergreen, its branches festooned with donated bells, balls and shiny baubles along with handmade cards and cardboard cutouts. Tinsel hung precariously to its pin boughs, weaving and shimmering in the warm yellow glow of kerosene lamps strategically hung around the room. In another corner might have been a ‘jig-pond’ where children paid one or five cents to toss a bent nail at the end of a line over a sheet hung across the corner, behind which a volunteer hooked on a wrapped gift and tugged on the line. There was enormous excitement in hauling back to discover what lay inside the recycled Christmas wrap from the previous year. Once supper was served there might be a children’s bingo game around the main table in the kitchen or a scattered game of cards among those who either couldn’t or preferred not to dance. Creaks from frost-filled hardwood floors of morning were replaced in evening by the incessant pounding of leather soled shoes step dancing in the center of the room. As soon as the fiddler or accordion player struck the first note a motley collection of dancers took to the floor. In time the dances became more ordered with the Lancers, the Reel and various other half-remembered patterns of movement where everyone was content to follow the lead of others. These were punctuated by an occasional break to cool off outside the door. Children took great delight to see steam escaping the bodies of the dancers as soon as they hit the cool night air. The stove by now had relinquished its role and cooled as the temperature of the room was sustained by body heat. As the evening went on and the tone of dancing grew more frenetic, someone was sure to be keeping an eye on the stove pipe lest it work loose from the vibrations. So, too, did someone keep an eye on the lamps. Should one begin to smoke or run out of fuel there was always someone to the rescue. Kitchen activity wound down to a minimum with most of its traffic being to the water barrel after about nine o’ clock. Children were ushered home to the care of sitters and the adults danced the night away. An hour or so prior to the event coming to an end a few of the women would re-heat a pot of soup for those keen on a late night snack. Is this reminiscence nostalgic, coloured by time and memory lapses? Yes. Does it describe the event in its entirety, leaving nothing out? No. Was a Time for everyone, with no exclusions? No. Undoubtedly there were elderly who couldn’t get out, some whose fortunes didn’t permit the luxury in a given year. 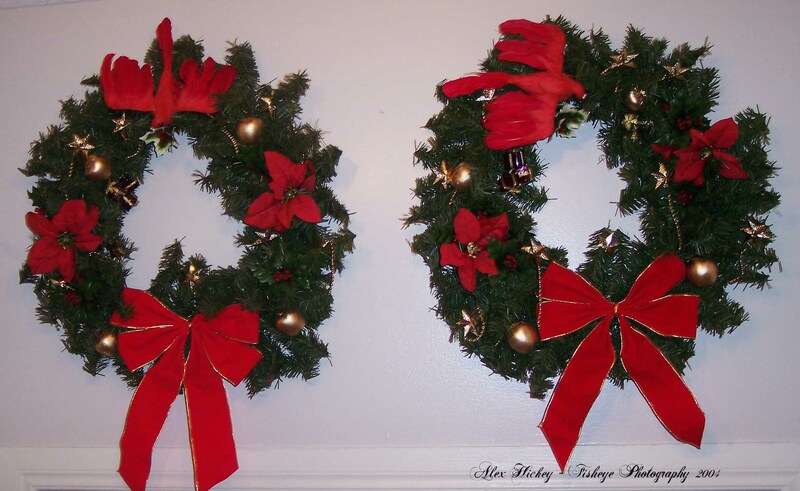 Does it offer a peek into community celebration of Christmas in one of our small coastal coves and harbours? Yes. Were there differences between a Time in the Roman Catholic Hall and the Church of England Hall? Of course there were but the essence was the same. Was it a universal experience? I don’t know. It seemed to be at the time. The presence of two denominations in the community meant two such events during the Christmas Season. Most residents went to both; however, there were always a few whose religious persuasions held them back. 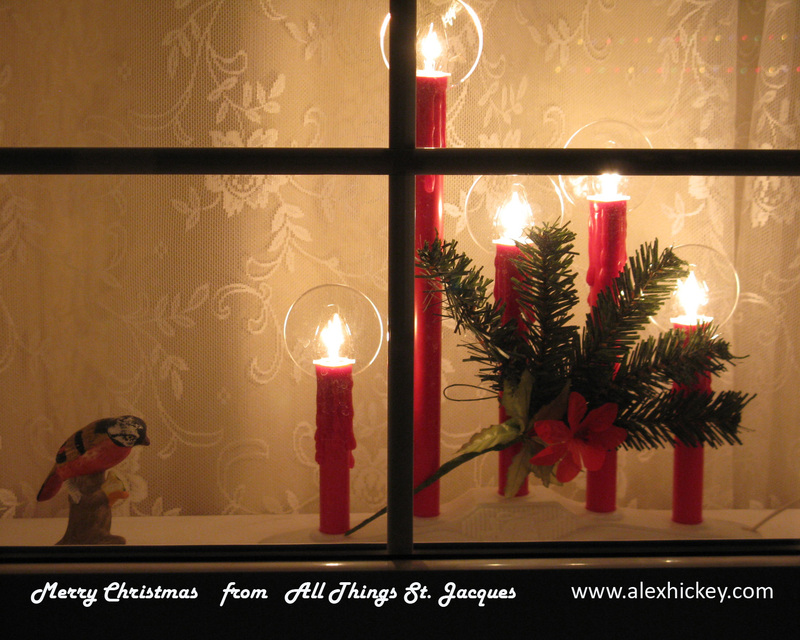 During the twelve days of Christmas there’d be a Time in each of the road-linked communities surrounding St. Jacques. One could never get to attend every one of them; however, a few were in order for all residents. A cautionary order was frequently given to youngsters in our house about being back from Mummering by seven-thirty because mom and dad were going to the Time in Coomb’s Cove or Boxey. Christmas was an occasion to suspend most matters of the world and enjoy the company of others; a time to relish the bounty of life around us and revel in the freedom of uninhibited dancing for its own sake. Times have changed as they have with every generation and the nostalgia of one becomes the curiosity of the next. If you’ve never encountered use of the work “Time” in this context here is an excerpt from the wonderful Dictionary of Newfoundland English, by G.M Story, W.J Kirwan and J. D. A Widdowson. Centre for Newfoundland Studies. Memorial University of Newfoundland Libraries. 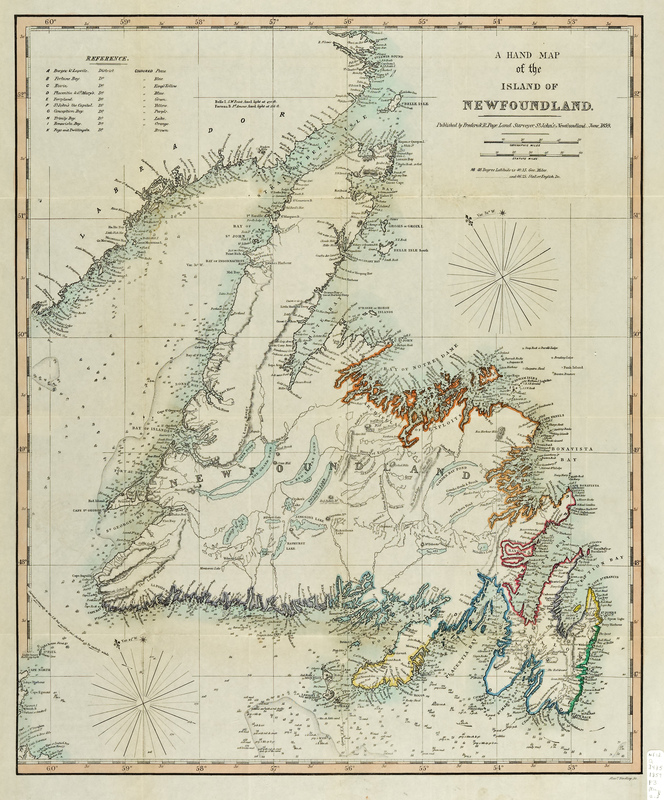 Map also issued with: Page, Frederick R. A concise history and description of Newfoundland: being a key to the chart of the island just published. London: R.H. Laurie, 1860. We Newfoundlanders are frequently confronted with the question, ‘Where are you from?’ The answer is much more complex than simply telling the person where you live. I can choose to live anywhere in the world but I will forever be from that place where I was born and has shaped my life in ways I am still discovering. For some that sense of belonging transcends birth; children whose parents were born in a particular place vicariously and actually maintain their own sense of attachment. It is akin to Thomas Hardy’s sense of place where his characters play out their lives and circumstances against the background of Dorset in southwestern England. The natural world surrounding Wessex is for Hardy a character unto itself; it becomes something with authority where people thrive within it rather than above it. Therein resides the answer to the question. If we take those two perspectives and apply it to the question of where we are from then we must consider the differences between what one sees from within the place looking out and what one sees from outside the place looking in. If we further restrict the perspective to how we physically differentiate the two positions then we allow ourselves to see, as if on a map, that place we come from. Someone who lives their entire life on the land, seeing their community through the lens of their kitchen window will have an entirely difference concept of what that community looks like physically than someone who has seen it from the sea. Land-forms viewed from the ocean camouflage warts and shortcomings, presenting to the eye an aesthetic beyond the mundane and grittiness of life in the moment. It encourages us to reach higher, more globally in our thinking, to a notion of place that is metaphoric, laden with symbols, belief, memory and dreams. Sit for a minute on the thwart of a buff-coloured wooden dory, trimmed with emerald green gunnels. Beneath, the swell of the ocean cradles your fragile yet stalwart vessel, seeks to infuse its rhythm to your body. Resistance results in awkward jerky uncomfortable physical balance and equilibrium responses; however, when you find that rhythm the gentleness brings calm, the awkwardness slips away. You move in unison, no longer conscious of the rise and fall or the lateral swaying. When you get there it’s like taking a deep breath, holding it momentarily, then exhaling slowly, allowing relaxation to flow unencumbered through your body. Now look back to the land. The steep spruce cloaked hillsides are rounded; their formidable boulders and ravines diminished to undulating forms. They’ve been given gentleness, a majesty where the forest has become much more than prickly pin boughs. Cliffs whose dramatic faces weather winter storms and stand witness to the passage of time serve to accent the transition between ocean and land. Deep crevices and scree become shadows and shape reducing their foundering layers and eroded base to a beige grey pencil line demarcating the two worlds. Waves washing against the worn and weathered boards of the dories sides pass in succession, moving inexorably with the tide to become mere ripples in the distance. Above, the blueness of sky bears witness to an occasional seagull gliding, its eyes scanning the ocean’s surface, including you looking back at its effortless flight. Headlands, coves, harbour entrances punctuate the shoreline, denying individual identity to the settlements of here, now and yesterday. We can easily see the landforms without our presence on them. Imagine what it must have felt like to the earliest people who approached our island shores from the sea; how they must have marveled at the looming dark ridge interrupting the far horizon, then the ever intensifying green spruce and fir punctuated sporadically by birch and maple. As they neared the shoreline they would have been in search of safe places to land, sheltering places to build and comforting places to live. Our indigenous people who travelled over ice and in canoe, our European settlers who arrived by ship and those who continued to seek this place in recent times all saw the shape and colour of the land before anything else. When we ‘look in’ from that vantage point we are struck with emotive things such as beauty, reverence, perhaps fear and trepidation of the unknown. Either way these are big feelings that supersede the everyday mundane moments of living within a community ‘looking out’. Since its earliest days of settlement the shores of Fortune Bay has been scattered with communities whose size ebbed and flowed with time and the local economy of the fishery. Over the centuries generations of people experienced the difference, seeing the headlands of their home from both directions. With the inevitable march of time many of those communities faded and disappeared, the details of their life stories vaporizing as morning fogs lift with the rising sun. Today we hear them in music and song, poetry and image; we hear them in lamenting voices of resettled peoples and see it in their faces; we see them in photographs packed away on the pages of memory. Row your dory or transform it into a powerful engine driven craft and journey throughout the Bay; explore every shoreline indentation and ask, did someone live here? Chances are, if you are motivated to ask there is something suggesting it to you. You are on the outside ‘looking in’, yet somewhere in time there were others in that cove ‘looking out’. Their view of the same rocks, reefs, sunkers, trickling streams and breaking waves might have been much different for they lived this space; for them it was where they were from. When I state “I am from St. Jacques” its resonance within me is greater than the physical arms of the harbour which gives it shelter. It also reaches back through time for centuries and through all of the lives come and gone that bring colour, sound and touch to that resonance. Such is the case for nearly every cove and harbour found along the intriguing shoreline. Someone came from there. Today, few of us can call these communities by name; fewer still can speak out loud the names of families or the given name of a local midwife, shop keeper, or the fisherman whose elegant stage graced the western side of the harbour. There are remnants to be found if you dig through layers of dead grass and the burrows of field mice or if you push back the overgrown branches of evergreens in search of still-standing marble monuments. Along the beach head, or in among the pebbles, broken crockery, glass and stubborn metal spikes might catch your attention if you look closely enough. Should you find a place to sit and survey your surroundings your eyes will begin to discern patterns in the soil upon which foundations gave rise to homes, or patterns where the meagre soil was tilled to grow root vegetables. Should you stop by at the right time of year, delicate whiffs of rose petals may drift across your nose or the intense fuchsia of a bleeding heart plant might stand in contrast to the deep grey lichen covered granite boulder behind it. Listen, the sound of water ebbing and flowing washing the shoreline is the same as it was a hundred years ago when it lulled residents to sleep. Turn your head in that direction and absorb the same breath of the ocean that entered windows opened along with warmth of morning sunlight. Someone came from here. Someone ‘looked out’ from here once. There are documents and maps which tell us the names of these communities. Many are the communities we know today. Some are familiar, some forgotten, some remembered. When passing by one of these former communities, it is not unusual to hear someone say, ‘how could people live in such a small and rocky space?’ There lies the question again for those of us on the outside of that community cannot understand what it meant to live there and those that did live there would have found it difficult to explain why. And yet they did, with enormous pride! The list below is compiled from data found in the 1869 Census of Newfoundland. Over half of these communities are now but memories; however, it is interesting to ‘look in’ on them a hundred and fifty years later. All names are spelled as they were found in Census documents. The recorded population for 1869 is given after the name of each community. Newfoundlanders have always gone away to work reaching back to the earliest days of settlement. When you think about it, many of the British and French fishermen who came here to fish prior to permanent European settlement were also men going away from their homes to work. Little wonder that practice gained a foothold in the population. Living in St. Jacques meant adjusting to temporary seasonal population shifts because of work patterns. Almost every man in the community of my father’s generation spent some time on boats in the fishing industry during their work career. Others who weren’t on fishing vessels were employed in the coastal shipping trades. It was a minority who didn’t go to sea. Many of the men found employment in the Nova Scotia fishing industry. They sailed the schooners of the nineteenth century and transitioned to the trawlers of the twentieth century as crewmen and captains. When spring was approaching the horizon the exodus would start and many would not be seen again until shortly before Christmas when they’d return home for their brief stay during the winter months. 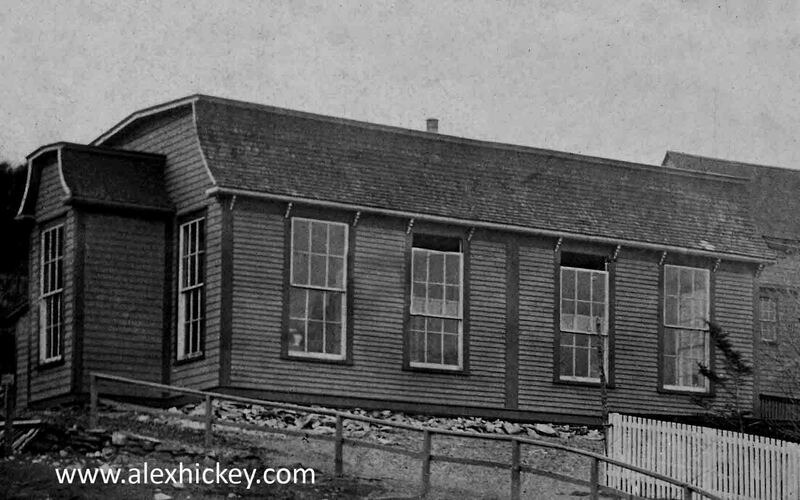 They fished out of such towns as Lockport, Shelburne, Bridgewater, Liverpool and Lunenburg on the southeast shore of the province and in such fishing towns as Port Hawkesbury, Mulgrave, Sydney, and North Sydney on the northeast shore. Though the working conditions were hard and the pay low by today’s standards many of them worked there for years. There was a common thread which ran among them even though they worked in different towns on quite a variety of vessels and in different fisheries – that was music. Music became their solace, their buoyancy which lifted them beyond the days’ work, took them home for a few minutes, and placed them in the arms of lovers or in a kitchen with their mothers. Some of the music and songs they took with them to Nova Scotia, others came from the folk music of that province while more came from the strong influence of American bluegrass and country genres. This was evident in the songs they sang when they came home. It was through these men I was introduced to the recordings of Lee Moore, Mac Wiseman, Hank Williams and other American recording artists. It was also from them I heard the early recordings of Hank Snow and Wilf Carter. In the late fifties and early sixties a Cape Breton recording artist gained prominence in the songs they sang in ships galleys and around kitchen tables, often with a few glasses to wet their whistles. His songs reached St. Jacques before his recordings for the men fishing out of Cape Breton learned them at source. LP recordings weren’t widespread in the communities between Belleoram and Wreck Cove until the mid-sixties when electricity became available to all residents. There were households operating on their own electrical generators which meant St. Jacques wasn’t devoid of record players. An occasional house still had the wind-up variety which played 78 rpm recordings. It was his version of the Wreck of the John Harvey that I first heard even though my grandmother was quick to point out that there were many more verses to the song that weren’t included on that recording. The fishermen had their favourites which quickly became family and community favourites through repeated exposure. Some of these included Down on the Big Shoal, Black Around Their Eyes, Wreck of the John Harvey, and The Legend of Kelly’s Mountain. Of course I am referring to the indomitable Charlie MacKinnon! Charlie MacKinnon became a household name in St. Jacques. There were very few people in the harbour who didn’t sing along to one of his songs at one time or another. 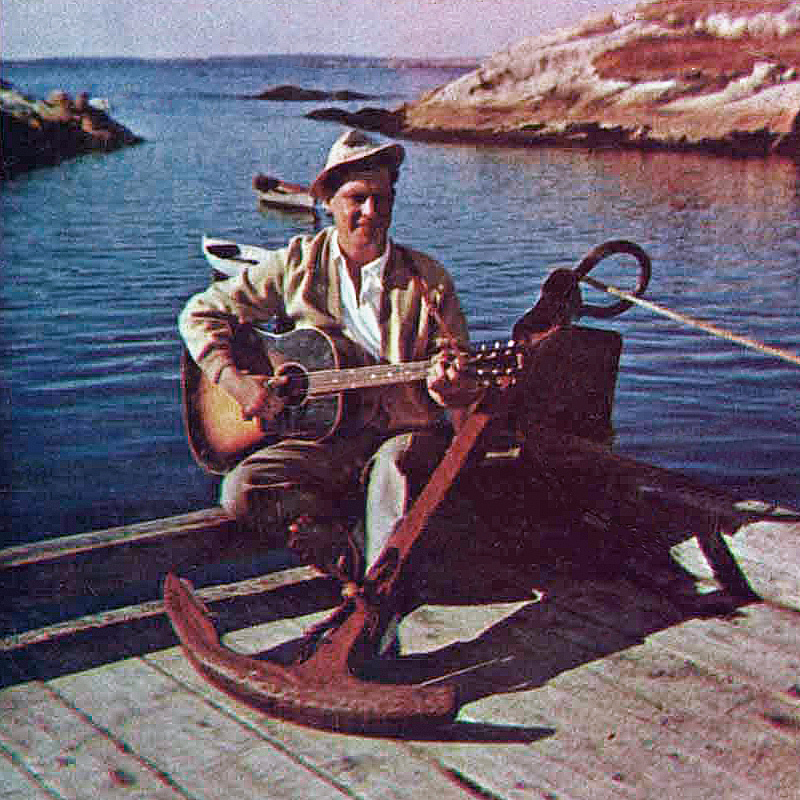 His album “Songs of My Cape Breton Home”, recorded in 1961, was the source of many of his most popular songs; however, another album recorded in 1967, “Free and Easy While Jogging Along”, proved almost as popular. The 1961 recording also included The Ballad of a Teenage Tragedy, An Old Haunted Castle in Scotland, Napoleon Bonaparte and the Bonny Bunch of Roses, The Wash Out on the Line, Waters of Iona, Twilight on the Cabot Trail and The Little Irish Maid. If I close my eyes I can hear men such as Tom Osborne and Jim Hynes singing, Down on the Big Shoal. As often as not, those men who didn’t sing loudly such as Uncle Den McCarthy and Ralph Fiander could be heard singing along as well as the evenings wore on. The frequency with which one is exposed to specific pieces of music contributes to a feeling of ownership in that the pieces become a part of the fabric of your life. These songs of Charlie MacKinnon were not incidentally heard and forgotten, they were sung, remembered and incorporated into the work history of the community. The singing of Down on the Big Shoal resonated with the fishermen, their families and friends for they intimately knew the song’s references. Black Around their Eyes spoke to the earlier generations of Newfoundlanders who worked the coal mines of Cape Breton and their many descendants in and around North Sydney know to the St. Jacques fishermen. Through that exposure we incorporated Charlie MacKinnon’s songs into our collective memory and in some ways appropriated ownership. The Wreck of the John Harvey held particular resonance for it existed in lived memory of many local residents who knew the crewmen and the witnessed the event. We knew Charlie through his songs and ranked him with the best. Charlie MacKinnon, who died in 1987 at the age of sixty-eight, was born in Little Bras d’Or on Nova Scotia’s Cape Breton Island. Among his musical influences were traditional Cape Breton musicians, and other performers such as Hank Snow, Wilf Carter and Jimmy Rodgers. He wrote some of his own songs; however, there was a poet/songwriter who had a profound influence on his repertoire. Charlie MacKinnon gained a reasonable degree of popularity and most likely could have achieved wide success as a performer, however, he chose not to pursue the life of touring and performing year-round. Instead he continued to work at the Sydney Steel Plant where he spent his career. He did tour the Maritimes and Newfoundland and performed on local radio shows. His legacy stands strong within his Cape Breton community and throughout Atlantic Canada. Like Charlie, most of the fishermen who brought his songs to the kitchens and living rooms of St. Jacques have also passed on. They too are remembered through his lyrics learned in the galley’s of fishing boats and sung around the kitchen tables of home. Many of them are still fishing down on the big shoal. Sacks of Prince Edward Island potatoes, carrots, cabbages, turnips and parsnips don’t seem to be the type of thing to stir excitement among children; however, each fall there was heightened anticipation in my St. Jacques neighbourhood when the vegetable boat arrived at the government wharf. Helping to load the heavy sacks onto the pickup truck and then off-load and carry them into the dark cellar for winter storage was thrilling. Climbing in over the stacks to cover them with heavy blankets to give protection from frost added to that feeling of being part of something important. In later winters vegetables were delivered by truck from J. Petite and Sons or Clifford Shirley’s store in English Harbour West, dropped off beside the gate to be transported by wheel barrow to the cellar. This wasn’t quite as adventurous and felt more like work. We didn’t grow many root vegetables even though there was no shortage of arable land to do so. Our family, like most others in the community during the postwar years, depended upon the fall shipments to get us through the winter. The attention of every child in the household was ensured by an additional attraction which arrived in a barrel. Imagine being eight years old again and a barrel of Gravenstein’s are delivered and stored in your cellar. You feel as though you have been catapulted into apple heaven. 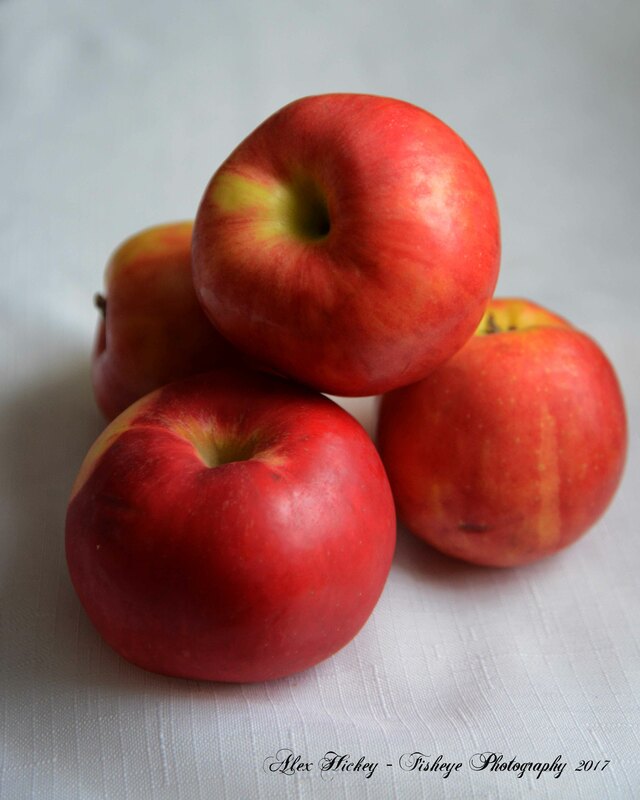 Savour for a moment the delicious aroma of red succulent apples drifting across your nose as you slowly open a door. That exotic, intoxicating aroma fills the room. Ever so gently you ease the door closed behind you and you pause, standing motionless in that bouquet, absorbing it through the pores of your skin. Twirl on the balls of your feet and the indulgence twirls with you. More than the aroma of a single apple in one’s hand, more than a bowl of apples on a kitchen table and more than a single corrugated box of apples in the local store, more, a lot more! Combine those evocative whiffs with the redness accentuated by delicate hints of yellow and green, a short woody stalk curving at a slight angle from the top. Feel the coolness of their waxy surface to your fingertips as you cradle one in the palm of your hand. You can almost hear the crunch of your teeth biting into its crispness and feel the sweet juice as it sprays against your wrist. I don’t recall how many years the practice of buying apples by barrel lasted. What I do recall is the power of one’s nose in fueling an appetite for them. Just a whiff would set off the urge to make another trip to the barrel, but along with the barrel came dire warnings not to attempt sneaking into the cellar. That warning was sufficient to keep one out for a while but not forever. The cellar door was airtight and padded against the cold so when it closed the heady aroma of living in an apple orchard dissipated. An added impediment to pilfering apples was the fact that the cellar door was located in the back porch thus any time the door was opened the smell of apples let everyone know. There was no need for alarm bells. Just as dramatic and equally as exotic was the warm, spicy, rich, mouth-watering aroma of fruitcake escaping from the well-worn oven door of the Enterprise stove. The transformation of a fruitcake in the oven from a gooey mess to a delectable treat for the human taste buds is nothing short of magical. As its ingredients of dried and candied fruit, mixed peel, raisins, currants, nuts and spices heat up and release their enticing flavours they combine with the browning effect on its outside, filling the kitchen with anticipation of Christmas. Cakes were baked well in advance of decorating the house, allowing time to age and develop like good beer and wine, complex characteristics for the palette and nose. When Christmas cakes went into the oven the year was waning and the days to Christmas dwindling. While the cakes were being mixed a good heat was established by banking the firebox until the metal of the stove exuded heat from all sides. Once the oven temperature reached its desired target and was sustained, it was only then the cake was put inside. Accompanying the ritual was another warning to us children to not go ‘jumping about’ or stamping your feet’ for fear of making the cake “sink” in the middle. Though I’ve never baked a fruitcake I’ve eaten quite a few of them through the years and have a particular liking for the dark variety. When I say variety I acknowledge that, though they may share many common ingredients, fruitcakes have more than subtle variations from one house to another, in taste, smell, volume, density, appearance and presentation. Cloves, cinnamon, allspice, mace and nutmeg, brown sugar, molasses, coffee, ginger, butter and occasionally dark rum, all combine to seduce one into a world of decadent dining. From one house to the next, differences could be ascertained based upon the measure of spices used – one Aunt preferred the use of more cloves than another; one neighbour had preference for more allspice than her sister-in-law. By the time I reached adulthood I could identify the baker of a cake through its ambrosia and distinct flavours. During the early years of my childhood the tree didn’t arrive inside the house until after all children were securely tucked into bed on Christmas Eve with warning that sleep was a condition to be met for Santa Claus to come. Trying to force oneself into a state of sleep rarely works as most of us have learned. Therefore, lying in bed, eyes tightly closed, ears wide open to every sound and a nose monitoring the air for anything out of the ordinary was a common state for most of us on Christmas Eve. The first hint that changes were happening downstairs was the smell of the tree as it was carried through the house to the living room. How could one mistake the pungent, near mystical odour of a freshly cut balsam fir when it first encounters the heat from a blistering hot wood stove? The scent still has a reassuring feeling associated with it for when it wafts across my nose I feel certain that spirit of Christmas has entered the house. When smelled late into the night on Christmas Eve it’s soothing effect was just the thing to tip one into a state of relaxation sufficient to bring on sleep. That sleep wasn’t populated with visions of sugar plums or angels; it was tormented most of the time by states of near wakefulness wondering if Santa Claus had arrived yet. A tentative opening of one eye cast towards the window would reveal the approach of daylight and the time to bound down the stairs to the living room. However, as often as not, I finally feel asleep and had to be awakened when the time came to get up. Walking down the stairs was like walking into an evergreen forest for the scent of the Christmas tree became stronger with every step. There is little that compares to the sight of a fir tree seen decorated for the first time on Christmas morning. Brilliant colours and reflections of light bouncing of delicate glass bulbs and strands of silver tinsel were as alluring as any circus or carnival of lights anywhere in the world. Seeing the tree in all its decorated splendour and absorbing that intriguing outdoors smell given off by the resin-filled blisters on the bark of the balsam fir, were almost as significant as the wrapped presents sitting beneath it. Throughout Christmas Day and the days which followed the tree would remind us of its presence by its scent. You could be sitting in the living room or anywhere in the house and all of a sudden pick up on its release of nature into the air. Whenever that happened it brought a smile of appreciation to my lips and still does to this day. A few days ago I was browsing a display of artificial trees which were quite convincing in their emulation of the real thing to the untrained eye of someone who hadn’t grown up in or adjacent to a forest. Hanging on a stand adjacent to the display was a container of metal tubes labelled spruce, pine, and fir. My curiosity got the better of me despite having a good sense of what was in each of them. When I opened the container a strong chemical smell assaulted my nose and made my eyes water. You would have to close your eyes really tight to imagine it truly smelled like a fir tree. It left me with a little sadness that somewhere children would wake up Christmas morning to that smell, not knowing the difference between it and the delicate tendrils of the real forest as it softly and gently ebbs and flows throughout a room. Layer on top of these scents that of freshly made cookies from the oven cooling on the kitchen counter-top and you have one of the most fulfilling experiences the sense of smell can deliver. Shortbread cookies topped with cuttings of red and green caramelized cherries in their centre compete for attention with textures of melting chocolate and coconut and add to the already luxurious presence of deep dark mysterious date squares whose filling comes from far, far away in the moist sub-tropical countries of North Africa. Molasses buns were a staple treat several times during the year, however, their presence at Christmas was a comfort, a sense of continuity that this Christmas experience was grounded in other parts and time of our lives. The same can be said for raisin tea buns and loaves of home-made bread eaten while still steaming from the oven. In the case of bread though, it was usually quite a challenge to convince the baker that it must be eaten now while still hot instead of waiting for it to cool down to make it easier to slice! In as much as these all add to the depth and breadth of an olfactory Christmas, the single-most cookie which evokes soft fuzzy memories, delicate savouring of its nuances on the tongue and lends itself to either breaking between fingers or teeth, is the inimitable gingersnap. More especially are they Christmas cookies when they are made in shapes of evergreen trees, snowmen and candy canes. These flat, delectable delights distinguish themselves from ginger cookies in their hardness and the distinct “snap” when broken into pieces. When these Christmas treats are baking the unmistakable presence of ginger in the air evokes more of Christmases past than any reading of Dickens Christmas Carol. While we gather as friends, family and kindred spirits this time of year let’s stop and “smell the roses”, as they say, count our blessings and reflect on the small human things which make events like this special in our memories. The things we smell, the sights we see around us, the taste of favourite foods and the people we reach out and touch create the feelings and memories we carry through our lifetime and pass on to others. Rarely in our busy lives do we consider taking time to reflect and act on those reflections, however, when the end of the calendar year begins to roll around we are most likely to fall victim to such a human disposition regardless of a faith or belief system. The universality of reaching out to those things which have brought comfort into our lives and still do, is one measure of our humanity. This year I remember the scents of the season and the threads they have twisted and woven through the fabric of my life. Our lives, like the humble but decadent fruit cake are all woven differently, yet running beneath the surface are the nuances which make us unique and at the same time remind us of all we have in common. For me it’s Merry Christmas! For you, it’s whatever salutation brings you joy! Most of us think of the men and women who served and died in war, when we hear the word Remembrance or the phrase Lest We Forget – and so we should. There is, however, much greater depth to those words, more inclusivity and broader meaning. There is an abundance of things to remember about war and the toll it extracts on people, places, institutions, culture, religion, society and governments. Yet, the greatest meaning does lie with the lives of those who volunteer or are conscripted into military service. WW1 or the Great War as it is often called, ripped the innocence out of Newfoundland and left us with a legacy of loss, the extent of which is still being felt generations later. Though all of the participants in that conflict are now dead, the cultural and genetic memory persists. We are left on this centenary to ask questions, marvel and wonder at the decisions made by political and military leaders; admire the fortitude and patriotism which sent young men and women to a foreign soil; and lament the losses which affected nearly every community dotted along the coastlines of Newfoundland and Labrador. Last year there was much attention given to the Battle of Beaumont Hamel where many young Newfoundland lives were lost. Since then, the one hundredth anniversary of the four year war seems to be over. There is but sporadic attention to events beyond that unfortunate battle. Very little is heard of the heroics of our Newfoundland soldiers as they carried on fighting until peace was at hand. There were heroics and medals awarded as well as commendations and proud moments for over two years after Beaumont Hamel. One battle which had profound effect on the Newfoundland Regiment took place as part of the continuing Battle of the Somme in April 1917. Newfoundland soldiers carried the day and delivered results well beyond expectations; however, the toll was enormous. 166 men were killed, 141 were wounded, and 150 were taken prisoner; the single largest capture of Newfoundlanders by the German military during the entire war. The list of names of those who died has been widely circulated; however the bravery of those men who were injured or taken prisoner is often ignored. Their contribution to battles won and lost as well as to the overall thrust of will and valor which contributed to victory in the end, is less recognized. Those men who were taken prisoner especially so. This year I choose to remember the Newfoundlanders taken as Prisoners of War and their contribution to all those things we say, have derived from that war. In highlighting the POW’s from Newfoundland I single out a young man from my hometown of St. Jacques – Lance Corporal Edgar G. Skinner, regimental number 2929. Edgar volunteered for service immediately after finishing school at Bishop Field College in St. John’s where he was studying to become a teacher. After school closed for the summer the nineteen year old student spent a few days home in St. Jacques visiting family. He returned to St. John’s in early July and enlisted. By the time he shipped overseas on the S. S. Sicilian on August 28th he was assigned to the First Newfoundland Regiment 3rd Battalion, C Company, Platoon Number 12 – Section 16. In his platoon with him were G. Moore, J. Tizzard, C. Day, W. Murphy, E. Dunphy, J. Sceviour, J. Lambert and D.E. Phelan of St. John’s as well as F.F. Simms of Burin; J.H. Little of Bonavista; S. Hodder of Horwood, Notre Dame Bay; C. Forsey and J. Harris of Grand Bank; J. Loveless of Seal Cove, Fortune Bay; and F. Morris of Trinity. In less than a year he would be resident in a German Prisoner of War Camp. At this point in time I know little of his experiences or of his treatment by German authorities. I can assume with relative certainty that his time spent there was not pleasant, and that his treatment was not good. Thousands of stories of life inside those camps have come to life over the century since and we can reason that Edgar Skinner experienced quite a bit of what these other men suffered. Their suffering wasn’t limited to injuries they may have received in the Battle of Monchy; it also included the self-perceived ignominy of being taken prisoner. It meant you could no longer fight beside the men you commanded or trained with; nor could you carry out orders to take the enemy. You were forced to work for the enemy tending fields, building roads, repairing trenches, and burying their dead in the battlefield often while your own side unknowingly showered bullets down upon you. You suffered there behind enemy lines thinking that there were those on your side who saw the fact that you were captured as cowardly. You imagined that some thought you had surrendered to the enemy to avoid fighting. All of these things played on the minds of POW’s causing them extreme mental anguish. Coupled with the continuous hard labour most were forced into, and the poor nutrition which they endured, it is a wonder that any of them made it through to the end of the war. Some didn’t. These men endured war at the hands of their enemy unlike anything human beings had seen before. Their suffering was daily, nightly, and weekly, seemingly without end as the war dragged on. They were allowed to write letters home, however, their letters were heavily censored, allowing only the perfunctory salutations and most general comments to get through. Below is an example of a letter from Edgar Skinner sent to his widowed mother on August 19th1917, which she submitted to the St. John’s Daily Star for publication. Again I have the chance and pleasure of letting you know that I am still well. My address is on the opposite side (my name, number, and company, and after that the writing which is over your address). Try and write the Red Cross and tell them to send me some parcels. Do not worry about me. I hope Lester, Owen, and you are well. This was not Edgar’s first letter home for he says, “I have the chance of letting you know I am still well.” He makes no mention of the injury to his head he suffered during the Battle of Monchy le Preux, nor does he suggest he is being maltreated. In fact, at first glance it would seem that all is well. Twice in the short letter he tries to reassure his mother. He asks her not to worry about him and goes on to inquire about his brother-in-law and nephew. He asks little of his mother but to entreat the Red Cross to send parcels which is something the Red Cross had positioned themselves to do by this stage of the war. His seventy-three words are sparse and devoid of anything related to his status as a POW. Nor does it contain any comment or question about the war. He provides a mailing address but we do not know where he is being held prisoner. There is no indication of who else may be there with him. In short, the letter is almost devoid of information. From the above it is evident that prisoners of war are only allowed to write at fixed intervals, dependent probably upon good conduct or upon the pleasure of the Camp Commandant. Lance Corporal Skinner was made prisoner in April when so many of our boys were either killed or captured. There were other letters from Edgar during his time as prisoner of war. All of them held true to the scarcity of information in this letter. Edgar remained a prisoner of war until he was repatriated on December 25, 1918. The twenty-one months Edgar Skinner spent as POW must have been horrific in many ways. He wasn’t alone in his experience. Other Newfoundlanders shared the experience though not always in the same prison camp. What we must never forget about those prisoners of war is that they too were serving their country, giving of their mental and physical strengths to see it through to the end and victory. What they didn’t know, and must have thought about every day, is what might happen to them if their side lost the war. Lance Corporal Edgar Skinner returned home to St. Jacques after the war and later moved his mother and nephew to Canada. There, he rose to the position of Captain on oil tankers shipping between Canada and South America. He also joined the Navy Reserve and when WWII broke out, volunteered again to serve. This time he entered the war as a commanding officer and served on a variety of navy ships including the HMCS Arrowhead and HMCS Monnow. He was awarded the Distinguished Service Cross by Canada and the RCNR Officer’s Decoration (RD) by the United Kingdom. 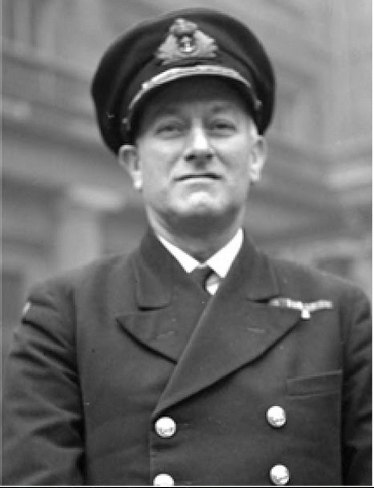 Commander Skinner participated in the Battle of the St. Lawrence and the Battle of the Atlantic while on convoy duty. Following the war he retired to private business in New Brunswick and died six years later. Edgar was born August 14th 1897 and died on February 28th, 1953 at the age of fifty-five. Edgar Skinner was the son of Captain Abram and Catherine (Kate) Skinner. Their home was located amidst the other Skinner homes in the bottom of St. Jacques harbour, sitting on the lower side of the main road between houses owned by Ralph Skinner and Albert Skinner. Like most of those homes, that building is long gone. After the Skinner’s left, it changed ownership several times. Captain James Dyett lived there for a period of time as did Jacob and Blanche Fiander when they first married. The last owner was Mrs. Agnes McCarthy. For me, that is even more reason to stand on Remembrance Day and remember the sacrifices of men like Lance Corporal Edgar George Skinner. Let us not forget the many ways in which our people served in the Great War and all those before and after. This year when the names of those who died are read, let’s remember as well those brave Newfoundlanders who suffered serious injury and those who were taken prisoner by the enemy like Lance Corporal Edgar G. Skinner. A few years ago the Government of Canada announced that it would divest itself of a number of light houses across the country including the one on St. Jacques Island in Fortune Bay. Provincial governments were given first option to take them over, followed by municipal governments and barring interest from them, a third party could submit a proposal. If there was no interest the lighthouses would simply be left to deteriorate over time or be dismantled. I reflected on the possibility that we could see the end of the iconic lighthouse on St. Jacques Island if no one showed interest. At that point I decided that if the provincial government or the municipality wasn’t interested I would make an effort. That set in motion a process which led to the establishment of the not-for-profit St. Jacques Island Heritage Corporation with a Board of Directors and the submission of a business plan to the Department of Fisheries and Oceans in 2013. What followed was three years of meeting, planning, negotiating and eventually signing a Memorandum of Agreement signing over the lighthouse, out buildings, the light keeper’s residence and the island to the St. Jacques Island Heritage Corporation. The Corporation has as a mandate the preservation of the light tower for future generations and the provision of programming to inform and educate people about the light tower. It intends to do that by developing the light keeper’s residence as a tourism rental facility and artist retreat which will raise funds for the preservation of the light tower and programming. The planning for this is now underway. We also sought to have the lighthouse designated as a National Historic Structure by Parks Canada. This took another level of effort and months of work. In the end we were successful in achieving our goal. The St. Jacques Island Lighthouse is now recognized as a National Historic structure in Canada. What follows is the text of the case Parks Canada accepted for this designation taken from their site which you can view at Parks Canada’s Page on the St. Jacques Island Lighthouse. The St. Jacques Island Lighthouse, also known as the Fortune Bay Lighthouse, is a 12 metre (39 foot) white, cylindrical, cast iron tower. Built in 1908, the lighthouse is the first on site. The lighthouse is situated on a 30-metre (100-foot) cliff on St. Jacques Island overlooking Fortune Bay, on the Southern coast of Newfoundland not far from St. Pierre and Miquelon. The island’s high visibility has made it a location marker for mariners for centuries. The St. Jacques Island Lighthouse is a heritage lighthouse because of its historical, architectural, and community values. The St. Jacques Island Lighthouse is an excellent example of the system of lighthouses that was initiated in 1811 on the coast of Newfoundland and grew rapidly in the late 19th and early 20th centuries. Pre-Confederation lighthouses built in Newfoundland during this period were typically pre-fabricated cast-iron towers. This design was preferred for the climate of the Newfoundland coast because the towers were durable, relatively inexpensive and easy to erect on remote sites. The St. Jacques Island lighthouse illustrates the expansion and development of the lighthouse system during this period, when the British colony was still almost entirely economically-dependent on aquaculture (fishery). The lighthouse also illustrates Newfoundland’s relationship with industrial England, where the pre-fabricated lighthouse was manufactured by the renowned Chance Brothers and Company. The St. Jacques Island Lighthouse was fundamental to the socio-economic development of the communities in Fortune Bay. The lighthouse aided in providing safer navigation for a local fishing fleet that tripled in size at the end of the 19th and early 20th centuries. It facilitated the use of St. Jacques as a safe harbour for off-shore fishing vessels during stormy weather, a role it had served since the early 17th century, and made local and transitory navigation more secure for small inshore vessels, mail boats, passenger ships and commercial vessels. The St. Jacques Island Lighthouse demonstrates excellent aesthetic design with its elegantly tapered, cylindrical tower with a well-proportioned and attractive lantern. There are only two openings on the tower: a small window located a third of the way up the shaft and a rounded iron door at ground level. The lantern features a “crow’s nest”inspired gallery reminiscent of the enclosed lookouts found on the mast of ships. 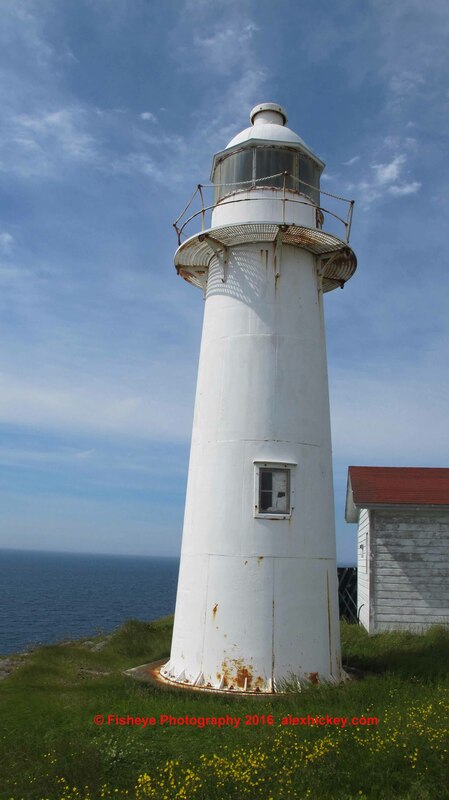 The lighthouse exhibits very good functional design in its pre-fabricated, cast-iron construction technology typical of the Newfoundland coast during the late 19th and early 20th centuries. The tower consists of rounded rectangular sections that were pre-fabricated in England, and subsequently assembled on site. Seams were filled with lead and caulking, creating a smooth exterior and eliminating any edges or seams where water from the harsh maritime climate could collect or infiltrate the building and lead to corrosion. The lighthouse embodies the coastal maritime character of its setting, and is a local landmark in Fortune Bay, as evidenced by the picturesque qualities of its design and form. Its location on a steep 30-metre cliff and the lack of vegetation surrounding it makes the lighthouse highly visible from all around the Bay. The town of St. Jacques-Coomb’s Cove is comprised of six communities nestled within various inlets that incorporated in 1972: St. Jacques, English Harbour West, Mose Ambrose, Boxey, Coomb’s Cove and Wreck Cove. When the town incorporated and its boundaries were drawn up, it did not include St. Jacques Island, which was under the jurisdiction of the federal government. The town of St. Jacques-Coomb’s Cove is currently in the process of having its boundaries redrawn to include St. Jacques Island specifically for the purpose of having the lighthouse designated as a municipal heritage site, reinforcing the importance of the lighthouse to the community. 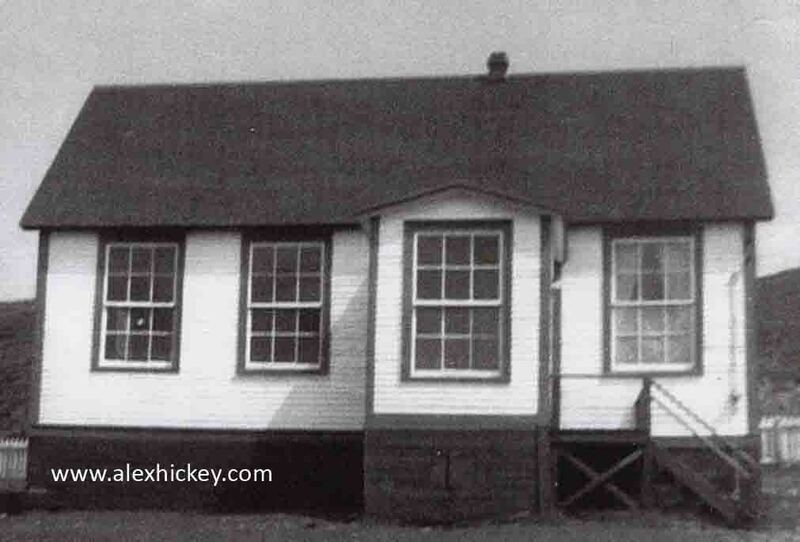 There are four related buildings on the site that contribute to the heritage character of the lighthouse: (1) the 1960 light keeper’s residence; (2) the 1960 Generator Building; (3) the 1960 Equipment Building #1; and (4) the 1999 Equipment Building #2. Note: Since this was prepared by Parks Canada, the town of St. Jacques-Coomb’s Cove has been successful in achieving a boundary change which now includes St. Jacques Island. The St. Jacques Island Heritage Corporation anticipates that the designation of the light house as a municipal heritage building will take place in the near future. This will be the first building so designated by the town. “It’s been twenty-five years. The last time I was here the stage was right up there at the end of the field, a flat-bed truck I believe. By Jeez there’s some difference now; yes sir!” Frank Skinner. And so the conversation went. We chatted about family, acquaintances, things which happened over the course of that twenty-five years, the music, and the performers, all the while scanning the crowd seeking friendly familiar faces. They were there everywhere you looked; some from last year, some from five years ago, a few only recognized because of resemblance to their mother or father and an occasional one familiar in the way they walked. Such is the annual experience of visitors to the South Coast Arts Festival in St. Jacques. From the time the gates opened on Friday evening and closed on Sunday evening local performers, occasionally joined by visitors or guests, providing wall-to-wall music that traverses genre. Hearts beat a little faster and eyes moistened when on Friday evening, a performer struck up a version of Johnny Drake’s song Headin’ Home, for the majority of Festival patrons know that feeling of turning off the TCH onto the Baie D’Espoir Road heading to the South Coast. The song has become somewhat of an anthem for residents and visitors alike. Then, on Saturday crowds swelled and gathered about the main stage when Bud Davidge took to the microphone to deliver a selection of his crowd-pleasing songs. The Loss of the Marian had people swaying and Music and Friends had the audience singing in unison. On Saturday afternoon pre-school children flocked to the face-painting activities of the Family Resource Centre while parents stood back allowing them to frolic in the sun on a manicured grassy field. All the while melodic sounds of guitars, accordion, fiddles and drums, shaped and tugged by sound man Rob Rogers, floated across the Festival site, rose and skirted the side of Big Hill then drifted across the harbour and on out into Fortune Bay. Ask where are you living now, and you’ll hear Pouch Cove, Lark Harbour, North Sydney, St. John’s, Calgary, Spryfield, Fort Mac, Boston, Germany, Australia, Lamaline or Gander. 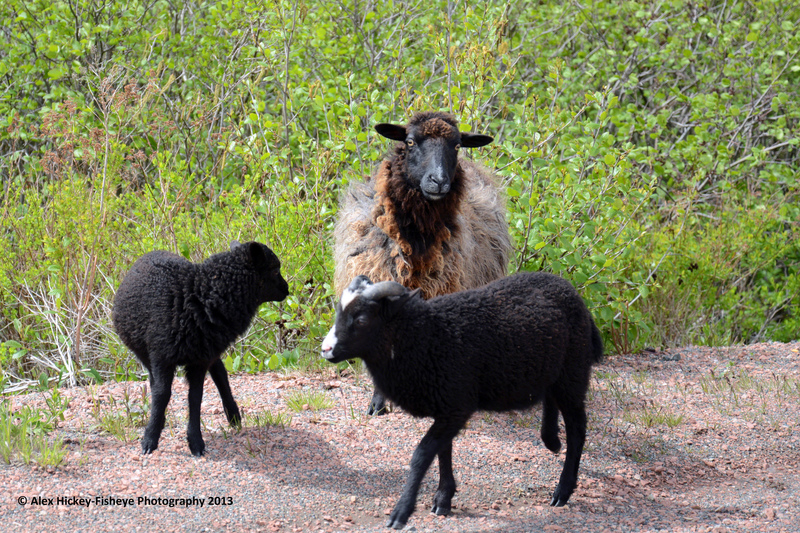 They come back from all over to enjoy the wealth of musical talent the south coast of Newfoundland has to offer. They come back to visit family, to renew acquaintances, and to meet the children of their childhood friends. They come as individuals, as families and in groups vacationing together. They come out of curiosity having heard of a three-day arts festival all the way down on the South Coast almost at the end of the road. Wherever they came from in August 2017 they came with intent to party, to celebrate and socialize. One visitor said, while it is good to get together for family reunions it is also really good to get together as a community for a reunion. That describes well what happens during the second weekend of August in St. Jacques. St. Jacques is one of six communities which comprise the municipality of St. Jacques-Coomb’s Cove. The South Coast Arts Community embraces the adjacent towns of Belleoram and Pool’s Cove, reaches out to Rencontre East, Harbour Breton, Hermitage, Conne River, Milltown and St. Alban’s. Performers and visitors from all of these towns can be seen on the Festival Site throughout the weekend. The community that gets together isn’t St. Jacques, it’s the entire Connaigre Peninsula congregating during the weekend as a single community of music lovers to celebrate culture, heritage, each other and the thread of artistic expression which bind us all together. Community-based volunteer groups such as the Lion’s Club of English Hr. West and the St. Jacques-Coomb’s Cove Fire Department provided food services and assisted with security. The Community Health Group made their Paramedics and ambulance freely available during the weekend, particularly during the 5K/10K Walk/Run which took place on Saturday morning; a walk organized in partnership with the St. Jacques-Coomb’s Cove Recreation Committee. A local aquaculture firm, Northern Harvesters, delivered complimentary vats of freshly frozen ice for use at the bar. A small army of volunteers kept the wheels turning and the energy flowing throughout the weekend, checking ID’s, providing backup to other performers, answering questions, and ensuring everyone was safe and able to have a good time. A short distance beyond the entrance gate returning visitors and new, parked their recreation vehicles and trailers side by side, got to know one another and savoured the musical atmosphere surrounding their weekend home. One departing visitor was emphatic in saying he’d be back next year and that he’d be bringing friends. Accenting the music was a showing of films by well-known and award-winning Newfoundland film-makers, many of which had roots on the Connaigre Peninsula. Riverhead, Crocuses and The Tour captivated audiences for two nights at the St. Jacques Community Centre. The Nickle Roadshow is offered in partnership with the Nickel Independent Film Festival of St. John’s and celebrated its sixth year at the South Coast Arts Festival. How do you run a four-day arts festival uninterrupted for thirty-two consecutive years? There is no simple answer; however, within it are such descriptors as pride, dedication, belief, giving, selflessness, stuck-to-it-ness, resolve, commitment, love, enjoyment, sharing and sometimes a tiny bit of smugness when you step back and watch hundreds of people enjoying themselves year after year. At its heart is volunteerism; volunteers who plan, organize, publicize, perform, clean, do maintenance, collaborate and respect the contribution each other makes to ensuring a successful event. Yes, it is quite different from twenty-five years ago, quite different from the first Festival on that site when lawnmowers were used to cut bushes and sawdust used to fill depressions left from removing boulders by hand. What isn’t different is the vision of that handful of founders who imagined what would happen thirty-two years later on 2017. Though some have passed on and others moved away there are still a few of them wandering among the fifteen, twenty and twenty-five year veterans who continue to bring to the field in St. Jacques one of the best festivals in Newfoundland and Labrador. As the last note escaped, the last glass clinked and the last hug given, plans were already underway for next year at the Festival. We’ll see you there again next year if all goes as planned. Were one able to line up, end-to-end, the thousands of trout caught in St. Jacques Pond throughout the generations of people from St. Jacques and Belleoram it might rival the ‘squids’ in the Ted Russell recitation, The Smoke Room on the Kyle. Many a young boy and girl experienced catching their first fish on the shores of that pond under the tutelage of an older more experienced trouter. Trouting St. Jacques Pond was a common thread that ran through the surrounding communities and succeeding generations. 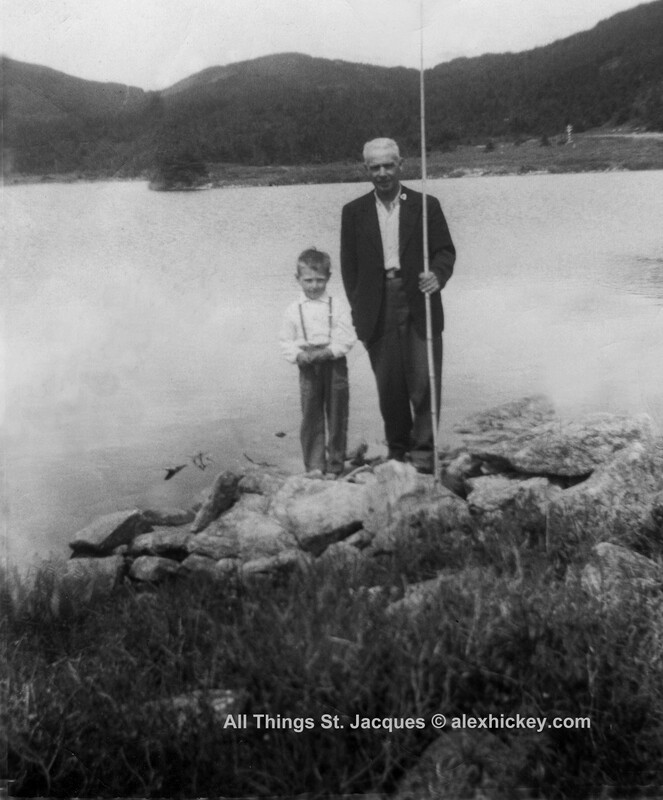 My early trouting experiences in St. Jacques Pond were with my father and a cousin of his, George Drake, who would lead me by the hand up the hill at a most leisurely pace, for George didn’t move too quickly under any circumstance, beyond the home of Uncle Den and Aunt Hilda McCarthy. The Tibbo family had a grass meadow adjacent to the southern end of the pond which made for easy access and a comfortable place for trouters to sit and enjoy the ambiance of the valley. I don’t recall catching many trout on those occasions; however, I do recall being coached to cast my line out into the water. The length of the bamboo pole seemed at least five times my height, making coordination a bit of a challenge. It seemed that no matter how hard I swung that pole towards the water I could not get the hang of flicking the line. Each time it mysteriously fell to the surface just feet from where I stood, yet when George took the fishing pole to demonstrate, the string effortlessly arced through the air and landed well out into the deeper water. Little skills like that seemed magical at the time. Later, as a pre-teenager I spent endless hours with other kids from the neighbourhood, Carl and Tom , Cliff, Kev and whoever else was inclined to spend an hour or two getting their feet wet clambering around the shoreline. Everyone had their favourite spot which they fished until the trout stopped biting, then moved on to another. We could be seen standing at any location where water flowed in or out of the pond, jockeying for the best or most solid rock to balance on; that is until ones feet slipped into the water. After that, getting wet wasn’t a concern and wading out into the pond to fish farther off shore was routine among us. Sometimes we would encounter others fishing the pond and give them wide berth for one didn’t want to be accused of interfering with their success by making noises that might frighten the fish away. Usually these were folks of our own age from Belleoram, many of whom we knew. Later still, I took my young daughter back to St. Jacques Pond for the experience of trouting. We climbed through fallen trees and over grass covered boulders to reach the mouth of the brook which feeds water from the Barred Pond upstream. There she learned to cast a line into the little pool and reel in her first brook trout. The glee in her face translated to an excited dance of stamping her feet, splashing water well above the tops of her ten inch rubber boots. She was willing to assist with placing worms on hooks but drew the line at removing a wriggling trout from that same hook. Trouting is a passion for young boys and girls; one that courses through their veins, a passion to get the gear ready the night before and motivation for an early rise the next morning. Bait, of course, was always a per-requisite to catching trout. After dark on damp foggy nights there was a ritual in our neighbourhood to hunt for night crawlers; larger worms that emerged from underground when the grass was moist with evening dew. We would walk, bent from the waist along those pathways where we knew they could be found, one hand holding a container and a flashlight, the other hand at ready to grab the crafty worm before it deftly withdrew into the earth. Like every other sport those that got away were always bigger than the ones we caught. There was a level playing field amongst most of us. Our implement was the bamboo pole, rigged with cotton line, a hook at the end weighed down by lead weights. In the absence of lead weights a small machine nut from the garage of one of our parents sufficed. Depending on the depth of water, the bobber could be moved up or down at will. There were those among us who preferred not to use a bobber but to troll the hook through the water resulting in much more frequent casting of the line. It was inevitable during every fishing excursion to the pond that one of us would hook a tree when casting, requiring some effort to disentangle the line; or hook a rocky ledge on the bottom which meant maneuvering to the left or right along the shore to dislodge it or in worse circumstances part the line and add a new hook. Occasionally one would flick a trout so hard that it came off the hook and land in the woods – the big ones we’d look for with futility, the smaller ones we’d ignore. Each of those took time away from our primary tasks and were not looked forward to by anyone. We were among the world’s best trouters. We prided ourselves in never coming home empty-handed. It’s a wonder the trout population of that pond ever survived, but it did and is still as healthy as it ever was. A couple of years ago two of my nephews were visiting and wondering where they could go trouting. I showed them the way to St. Jacques Pond and turned him loose. Every morning for the next week they were wetting their lines, carrying on a timeless ritual and bringing home just enough trout to fill a small frying pan! A recently deceased friend of mine, George Pauls, once described to me in a letter his experience of catching trout in St. Jacques Pond around 1930. Below is his description of standing entranced to see Teacher Fanny Cluett of Belleoram fishing the pond in her hip waders. “She was an ardent fisherperson (trouter), and in summertime, after those overnight light rains, we would be sure to bump into her the next morning somewhere in the brook or along the eastern side of St. Jacques Pond where she, fishing with a split-cane rod equipped with a fly-fishing reel, landed some of our best be-speckled beauties to frequent the area. Her equipment sparkled like gold to our eyes – us with our roughly ‘chopped in the woods’ trout poles, fitted out with coarse line and hooks baited with worms; the excess line wound around the butts of the poles, making it a nightmare when traipsing through the densely growing brushwood. Ms. Cluett wore hip-high waders well strapped to her belted breeches which was something of a novel arrangement at the time, especially with regard to the female standards that existed. Seeing her wade ashore with a couple flicking on the skiver to be wrapped in moist moss and placed in the wicker basket that she wore slung from her shoulders, was just as exciting as watching her cast and reel with such precision. She would take the brook somewhere in back of where the Allans lived (about mid-way between St. Jacques and Belleoram) and follow it southward to the lower or northern end of the pond where she did some clever casting and collecting of a few of the larger of the species, possibly of the sea-run trout that entered the water system from the Doctor’s Brook, as it was called till the water went over the falls which were partially dammed, then it was known as Pittman’s Brook. What George described was the dedication of a committed trouter willing to go the distance to get the “prize ones.” We, on the other hand, were joyous when we hooked one over five inches, whether we caught it or not! But for a few of us we were quite content to walk home with a half dozen threaded by the gills on an alder branch, our rubber boots squelching with every step, dried fly bites behind our ears and a victorious grin upon our faces.